On February 7, the Art Gallery of Ontario celebrated the opening of the exhibition Jean-Michel Basquiat: Now’s the Time with a packed program that included the panel discussion It Could Have Been Me: Perspectives on the Fight for Racial Justice and the Legacy of Jean-Michel Basquiat. 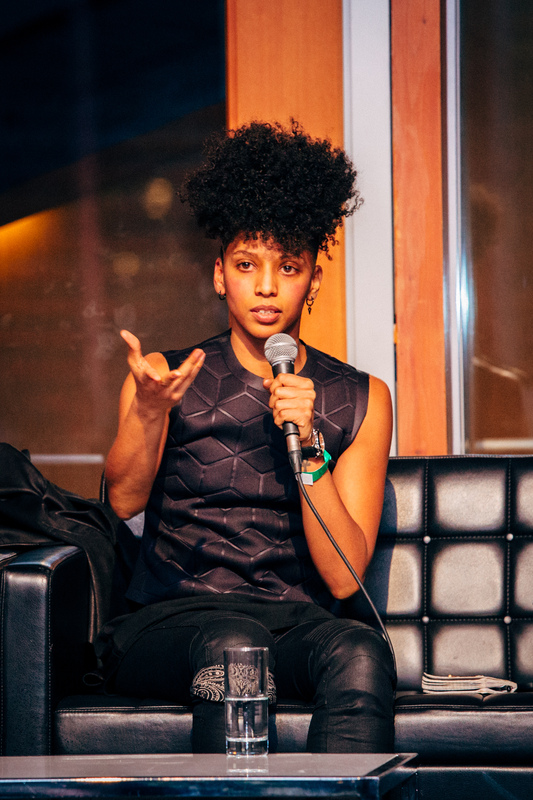 Presented with the Black Lives Matter Toronto coalition and moderated by Kim Katrin Milan, the talk featured artist and educator Randell Adjei, social justice educator janaya (j) khan, poet Mustafa Ahmed, and artist-activist Syrus Marcus Ware. 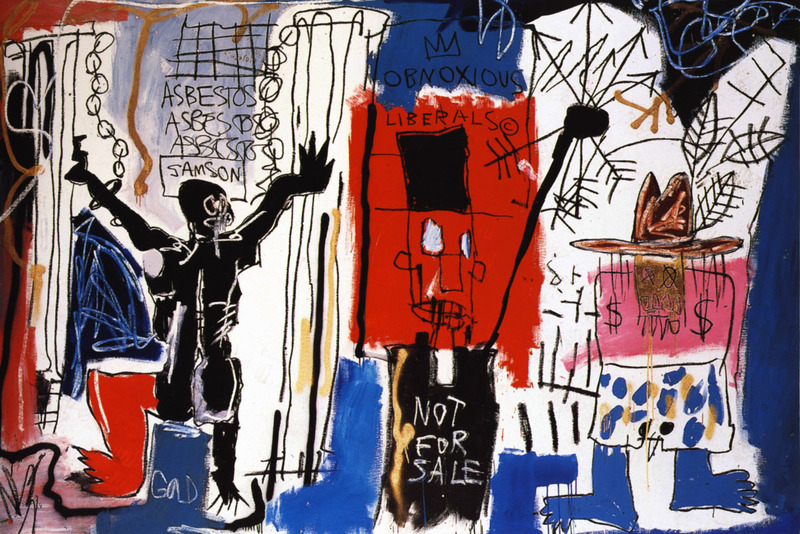 With an oeuvre that challenged racial and class inequities, Basquiat’s graffiti and abstract painting was a backdrop to investigating contemporary racism and activism in Toronto and across North America. The retrospective and AGO’s program coincides with popular debates on racism and police brutality and draws on social justice activism in the US. The discussion focused on anti-black racism, intersectionality, and the politics of inclusion. It was punctuated by conversations on the role of socially engaged art, the failures of Canada’s multiculturalism policy, incarceration and social location. The talk also put politics in action: several rows of seating were reserved for members of Black Lives Matter Toronto to centralize black experience not only at the event, but also within the AGO as an art institution. Opening with a question on artistic practice and activism, each speaker described their art—ranging from poetry to portraiture—as a process for political engagement, affirmation, and provocation. The artists create visibility for under-represented individuals to demarcate cultural space, autonomy, and self-determination. Adjei and Ahmed respond to the poverty in neighborhoods such as Regent Park, Canada’s largest social housing development, with outreach and art education. They embrace their respective ethnicity and religion—Adjei is Ghanaian and Ahmed is Muslim—and experience how these identities can taint police relations in Toronto. Ahmed particularly emphasized class position in determining socioeconomic opportunities in Canada’s largest city. Weaving together Indigenous movements, racism, gender, and queer politics, the topic moved to Canada’s official multiculturalism policy, incarceration and state-sanctioned violence. Ware and khan criticised the tendency to position Canada’s multiculturalism policy as morally superior to race relations in the US. This narrative obscures systemic racism and inequality. For example, the record expansion of Canadian prisons and recent "tough-on-crime" legislation, despite overall declines in crime, disproportionately affect visible minorities. In 2013, Aboriginals were 4% of Canada’s population, but over 23% of its inmate population. The number reaches 33.6% for Aboriginal women when data is gender desegregated. Black inmates account for 9.5% of the total prison population, but make up less than 3% of Canada’s population. These statistics are a glaring contrast to the “pervasive belief that we’re not as bad as the [United States],” said khan. Ware also lamented the lack of public attention given to murdered black transgender women and Aboriginal women, indicating a pressing need for understanding and tackling intersectional oppressions. Finally, the conversation moved to the politics of inclusion, visibility, and representation. All the speakers experienced the personal contradictions that accompany their institutional access, when other minorities remain marginalized. They pointed to the need for self-reflexivity, to not canonize individual artists and activists, while creating pathways and institutional memory for Others. Citing The Revolution Will Not Be Funded, the speakers pointed out the need to complicate the idea of "selling out" while remaining cognizant of funding sources and the path of dependency created by social justice NGOs. Consumer action such as reinvesting money into local businesses, said Adjei, can be a small way to bridge the gap between the institution and margins in Toronto. With optimism, khan concluded the discussion with the example of empire penguins, which huddle together in large groups to keep warm and take turns occupying the center. This metaphor speaks to a proactive solidarity to tackle intersectional oppressions, envision black futures, and decentralize whiteness. Tyler Chau is an Editorial Assistant for Warscapes. He is currently based in London and works in international development, art and politics. He received his MSc in International Development and Humanitarian Emergencies at the London School of Economics and BA in International Development Studies and Art History at McGill University. He is interested in the visual culture, theory and history of development and humanitarianism, indigenous and queer politics, postcoloniality and post-development theory. Twitter @tyler_chau.